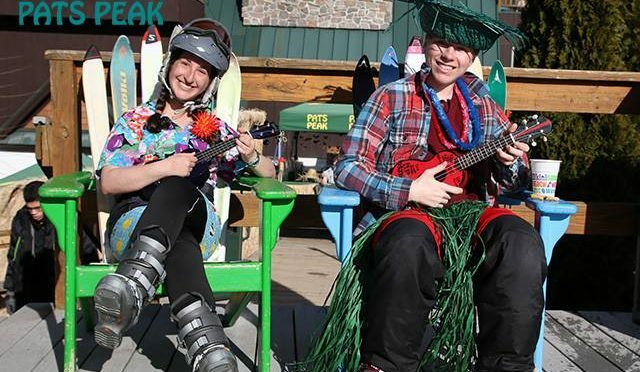 Henniker, NH – Southern New Hampshire’s Pats Peak ski area will hold its 26th Annual Hawaiian Weekend Celebration, March 11 and 12. 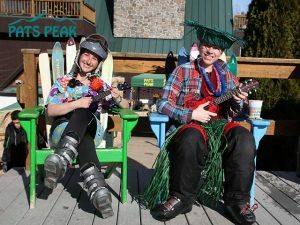 Hawaiian Weekend is two days of fun for the whole family to celebrate spring skiing and riding. It’s a Hawaiian celebration complete with tropical decorations, NASTAR races, Hawaiian-themed lunch specials, hot tubs and a rail jam. Throughout the weekend skiers and riders can enjoy the sounds of Jah Spirit Reggae Band in the ski area’s Sled Pub both Saturday and Sunday. Aloha Traveler Shandy is the sponsor of the après-ski party in the Sled Pub both days, which includes raffle prizes. The NASTAR Race course on Pats Peak’s Downdraft trail will be open to the public from 11 a.m. to 3 p.m. on Saturday and Sunday. On Sunday the 12th, there is a Man of Steel Rail Jam scheduled for 1 p.m. Sponsored by S&W Sports/S&DUB Board Shop, registration for the Rail Jam will take place day-of from 10:30 a.m. to 12 noon in the ski resort’s Valley Lodge. There is no cost to enter the contest but entrants must have a lift ticket or Pats Peak season pass and a signed release form, which must be signed by a parent or guardian for competitors ages 17 and under. Each year Pats Peak departments try to “out-tropic” each other during Hawaiian Weekend. Every year, each department is responsible for decorating its facilities and at the end of the day on Sunday, departments square off in an employee snow volleyball tournament. “Everyone looks forward to Hawaiian Weekend every season. It’s a great time to enjoy spring skiing and riding while wearing your tropical outfit. Every person receives a lei to welcome them to Hawaiian Weekend. The lodge and slopes are decorated with tropical decorations complete with palm trees. Our guests feel like they are visiting a tropical island,” says Jim Wall, Director of Services.